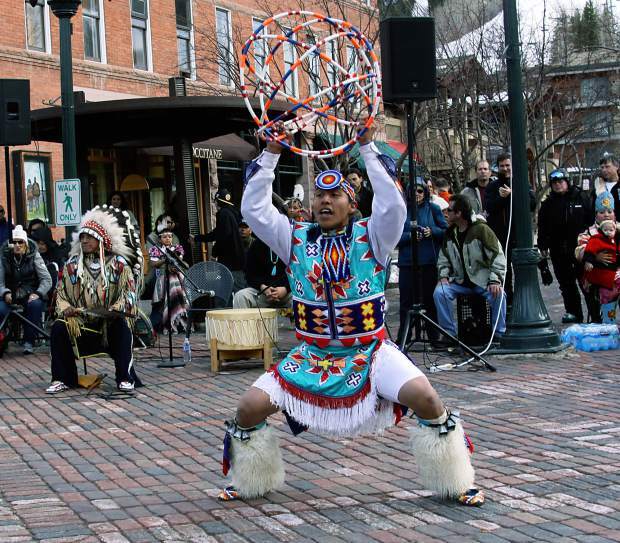 Sampson Sinquah of the Hopi tribe performs a hoop dance at the Native American Indian pow wow style dance and drumming exhibition performed at the fire pit plaza in Aspen in April 2014. Roland McCook, the former Northern Ute Chairman, sits in the background. The second Monday of October officially will become Indigenous Peoples Day after members of the Aspen City Council unanimously voted Monday night in support of Resolution 138. “What I really embrace is the opportunity to honor the Ute people who nurtured our valley,” Mayor Steve Skadron said. The city does not acknowledge Columbus Day, hence Monday’s meeting. However, Aspen banks were closed because of the federal holiday. Aspen resident Lorrie Winnerman suggested the city is treading a slippery slope by adding Indigenous Peoples Day. Deanne Vitrac-Kessler, the founder of the Aspen Ute Foundation, said she hopes to have Indigenous Peoples Day celebrations in Aspen in the future with Utes participating as well. “This is a message of love and hope and stopping a symbol that brings bad feelings and prevents people from healing and coming together,” she said.